Something you might have noticed while using Windows and various pieces of software, is that sometimes when there is a box or window on the screen, and if you want to alter its dimensions, you can simply hover the mouse over the edge and drag the window to a different size. The thing is, some windows allow you to resize them in their width and height, and some don’t. It’s also not uncommon for a standard window function like the minimize / maximize button to be missing or inoperable because the program has disabled its use or removed it altogether. In most cases, the window has been given a fixed size because the programmer feels it’s the correct size and doesn’t need altering. It can become frustrating if you feel the window should be bigger to display more information, or smaller to fit a given size, to take a screenshot perhaps. It’s quite annoying for us to have to scale an image because a window is 20 pixels too wide to fit on the webpage and isn’t re-sizable. Scaling reduces image quality, and it would be much better to shrink the window slightly rather than resizing the image. There are tools around that can help you reduce or increase the size of windows that normally don’t give the option to do so, or set a window to a preset dimension. Here’s a selection of 5 for you to look at. All tools were tested in Windows 7 64-bit. 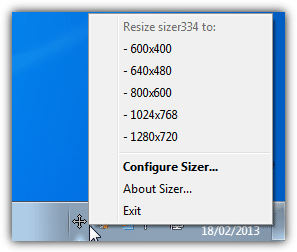 Sizer is a freeware utility that allows you to resize any window to an exact, predefined size. This is extremely useful when designing web pages, as it allows you to see how the page will look when viewed at a smaller size, and is also handy when compiling screen-shots allowing you to easily maintain the same window size across screen grabs. When you run Sizer the sizing arrows icon appears in the system tray and you can right click and select a size from the predefined list and any custom sizes you have set up, the last active window will then snap to that size. 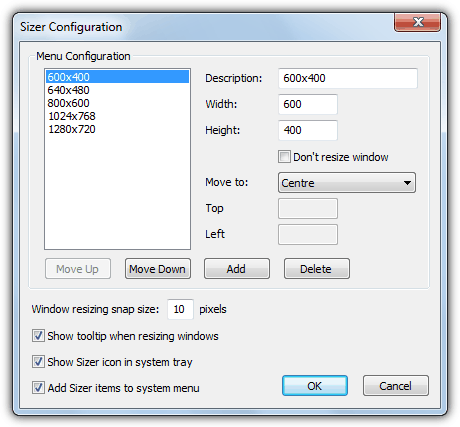 There are a few other ways to resize a window using Sizer. While it’s running, move your mouse cursor to any edge or corner of a window you CAN resize and right click. A pop up menu will appear with the list of predefined sizes and you can set the window to that size. Some windows will also have a right click system menu, which you can also add an entry for the Sizer defaults. Alternatively, you can right click on the Maximize / Minimize button in a window. To add new sizes to the menu or redefine existing ones use the Sizer Configuration Dialog. In addition to the default dimensions of a window, you can also set its default position to 9 presets or custom coordinates, and also snap windows to the closest size with the aid of the Ctrl key. Sizer has portable or setup installer versions, there is a development build with improved 64-bit support if you’re having trouble running the standard version. 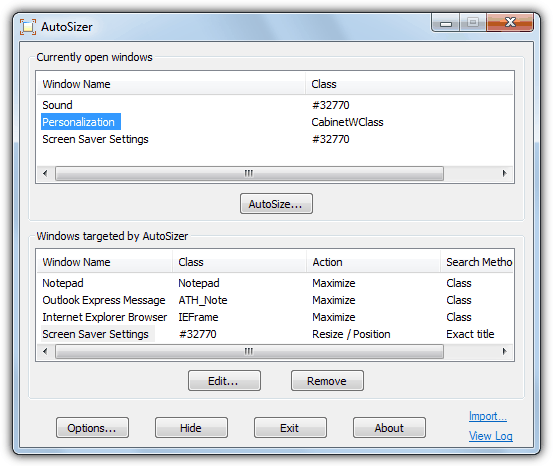 The way Autosizer works is slightly different because it sits in the system tray and when a window title or name matches one in its list, various functions can be applied to the window. You can choose to maximize, minimize, restore or alter the size and position of the window. The program works by displaying any open windows in the upper pane of the interface and those that are to be processed at the bottom. To select a window for processing, highlight it and press the Autosize button. You’ll then have the option to choose what to do with the window, and a custom size can be set along with the option to center or position the window at the specified coordinates. A tick box to set the window to be always on top is available in all modes. Windows can be identified by either class name or title, do note that many dialogs in Windows might have the same class name so you will need to use title matching instead. The tray icon will give you the option to rescan and apply the settings to any watched open windows and set any currently opened window to top most status. I only see 2 tools. Please tell me where can I found more tools. Just above these comments you should see black page buttons. Choose either “Next” or “View All” to see the other three tools. None of these tools work with the pc games from Libra Heart, the window is just not resizable. Sizer is the one I love. Very good tip. Thank you. thanks Ray for great tip today..